I would like to share the following watercolor with you. Like many of you, I hesitated at the thought of sharing my beginner attempts, however since this site’s purpose is to chronicle creative discovery here it is. Which reminds me, if you have not had the chance to listen to Sir Ken Robinson TED talk, I suggest you do so… he mentions so many things that can quite literary change one’s perception of art and creativity. Related to this post is the mention of children not being afraid of making mistakes, unlike the rest of us that as we get older may have accumulated a few fears. 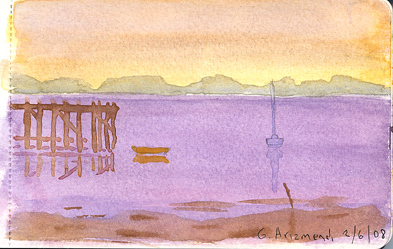 Therefore, below I share my second water color landscape/purple seascape, in the hopes that those of you that have gotten past this stage may have some tips, and those of you that have yet to get here can see that it is OK to not always get it right, and most important that sharing our trials is good for the community in general, as it gives courage to those just beginning. 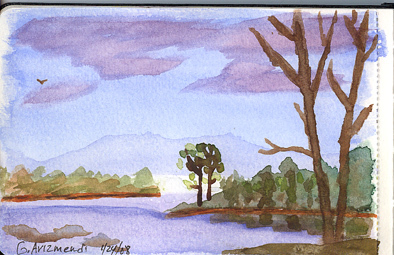 This and the other were painted on a watercolor moleskin, with Niji water-brushes. Here is a little watercolor I did yesterday, just trying new things as I continue learning the various processes.